On March 15, 2010, I had one of my greatest ticket pulls as a ticket broker. Just a few seconds after pulling front row seats to a Tom Petty show at Madison Square Garden, I pulled two more second row seats for that same show. Pulls of a lifetime, for sure, but knowing the techniques that made those pulls possible is what The Tickets Guide is all about. I knew these tickets were going to sell really well, but it was one simple change to my eBay listing that earned me close to $1000 profit on those two second-row tickets. It’s a change that just takes a single click and is especially important for those times that you’re selling absolute top-notch tickets. If I had not offered international shipping, these tickets wouldn’t have sold as quickly as they did. And even if you’ve only had minimal experience selling tickets online, you know that the longer you wait to sell your tickets, the more likely you’ll have to drop your prices. 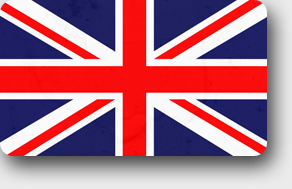 As you may have noticed in the image above, I do charge customers extra for international shipping. It’s a common practice on eBay to charge extra for international shipping and your customers won’t mind at all. This is true for shipments to Europe as well as to Canada. The last thing you want is to have to cough up international shipping costs, especially if you’re shipping close to the event date and/or through FedEx. Did you know that shipping tickets FedEx International Priority can cost you upwards of $40? Try to avoid this situation if at all possible, and that means sell your tickets early. The best way to ship tickets internationally also happens to be the best way to ship your tickets domestically: USPS Priority via Paypal. I’ve mentioned before that this is the best way to ship tickets because you can print your shipping slip right from home and you simply cannot beat the prices. 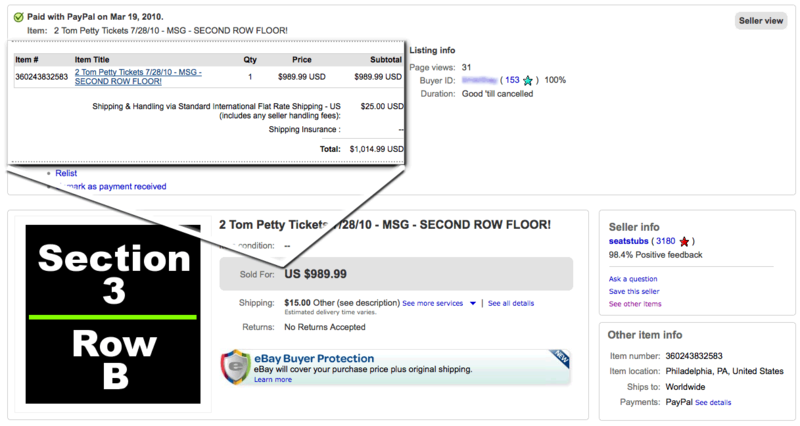 Above all, you’ll receive a Delivery Confirmation number that is crucial if you want to sell tickets on eBay. Yes, shipping internationally introduces a few new elements to your sale, but if you end up profiting $100, $50, or even just $10 more, the bit of extra effort is totally worth it. One of your goals as a ticket broker is to make your tickets available to as many people as possible, and offering international shipping is one of the best ways to do just that. What is the best price to start tickets at? What was your starting price for those tickets? What are your thoughts on e-tickets or flash tickets? If my problem was a Death Star, this artilce is a photon torpedo. Depending on the type of claim or chargeback the buyer files, you will need to provide either Proof of Shipment or Proof of Delivery to get coverage. For payments of $250 USD (or local currency equivalent) or more, it includes proof of the recipient’s signature to confirm delivery. 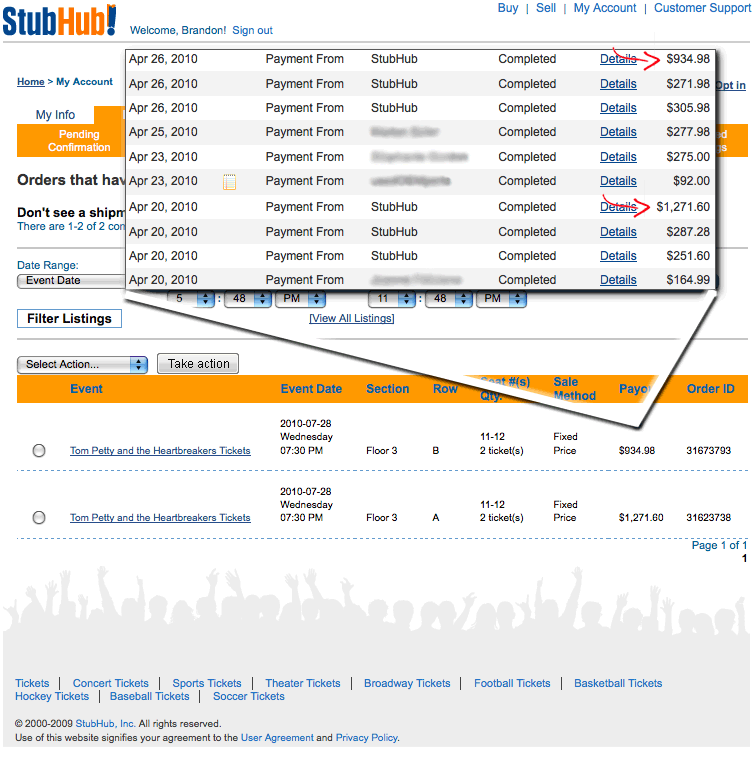 Do you have any experience shipping tickets to buyers electronically either via ticketmasters Transfer Tickets option — or on Stubhub uploading pdf’s from ticketmaster? do you have a preference with regard to dealing with real tickets vs electronic and computer printed tickets?